VISIT OF THE MAGI. 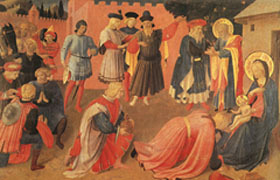 This painting by Beato Angelico depicts the visit of the Magi at Bethlehem in a European Medieval times setting. This is the Epiphany.